The February issue of Fair Lady magazine has published my horoscope illustration for Aquarius. What do you mean, you’d never guess that practically everyone I know is pregnant?! I made this by cutting each element separately from black vinyl with my NT cutter, then scanning and colouring in Photoshop. This illustration and a glorious sunset on Clifton 3rd beach on Wednesday evening means I’ve got beaches on my mind, so here’s a plug for my beautiful city, Cape Town. Boy, am I lucky to live here. U got tagged! Ok so you have to tell the world six weird things about yourself and then tag six others. that’s a mod mom illustration! Hey, thanks for the nice comments. In response to modmom: an NT cutter is the brandname of a Japanese pen-sized cutting knife that I use. It comes with very pointy steep blades that are great for my cutting work. And you are certainly lucky to live in Cape Town. 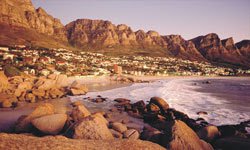 I have spent some time in Cape Town and love it. It is such a beautiful city!